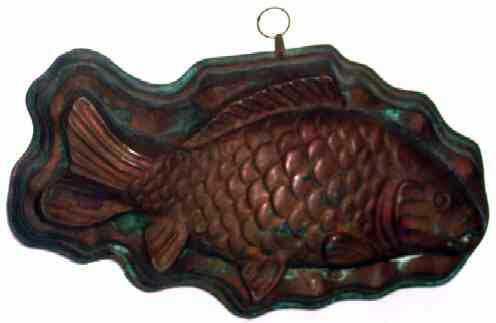 Outstanding Antique Copper Fish Mold of Heroic Proportions in the best, untouched patina and verdigris surface. We have left it as found, leaving it up to the new owner to determine whether to polish it or not. Nice, heavy weight and excellent detail. Size is 16" long x 8-3/4" wide x 2-3/4" high at the head while the height tapers to conform to the fish form. A RARE find and a wonderful mold to use or display on a kitchen wall! The Best!